Product code: T924 Categories: Art Deco, Art Deco Rings & Art Deco Engagement Rings. 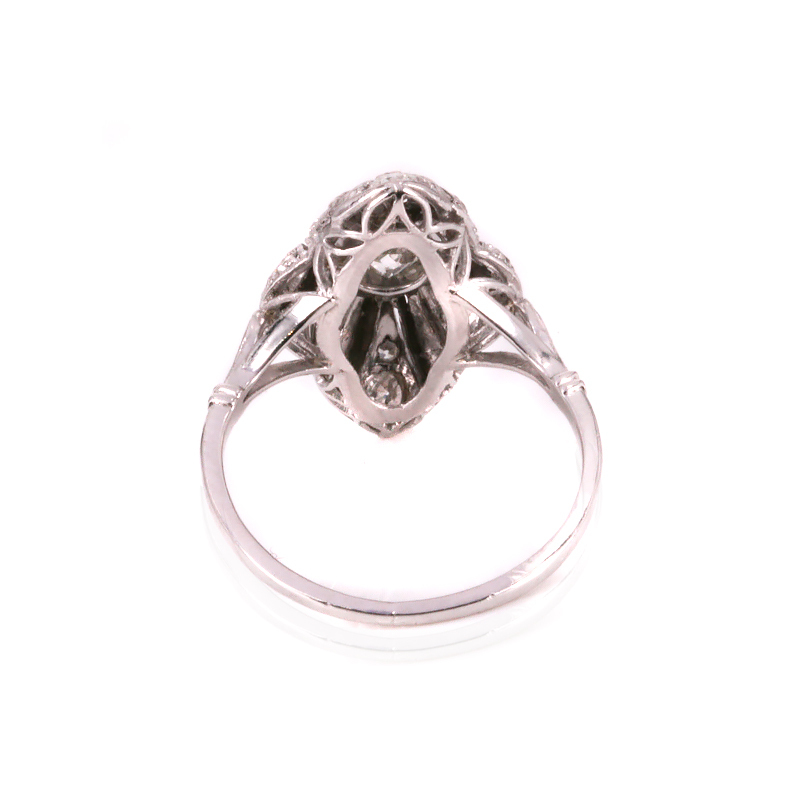 Art Deco jewellery of the 1920’s to the 1940’s is as popular today as when it was made and here is an incredibly beautiful and sculptured Art Deco diamond ring handmade in platinum from the 1920’s. Platinum has the distinct advantage over even gold in that it can be made so fine yet still be strong enough to hold both the setting and the diamonds and allow for the magnificent pierce work as can be seen in this ring. The design is so captivating to look at and will no doubt always be admired by all who see it. Sitting proudly in the centre is a lovely antique European cut diamond that measures 0.36 carats and then is highlighted in the most incredible design by eighteen more diamonds that have a total weight of 0.24 carats. With a soft flowing dome design, this ring is exemplifies why Art Deco jewellery is always sought after. This Art Deco diamond ring was entirely made in platinum and set with a European cut diamond and a further eighteen single cut diamonds.